Apple today announced financial results for the second fiscal quarter and first calendar quarter of 2015. For the quarter, Apple posted revenue of $58 billion and net quarterly profit of $13.6 billion, or $2.33 per diluted share, compared to revenue of $45.6 billion and net quarterly profit of $10.2 billion, or $1.66 per diluted share, in the year-ago quarter. Gross margin for the quarter was 40.8 percent compared to 39.3 percent in the year-ago quarter, with international sales accounting for 69 percent of revenue. Apple also declared an increased dividend payment of $0.52 per share, payable on May 14 to shareholders of record as of May 11. The company currently holds $193.5 billion in cash and marketable securities. In addition to the increase in the dividend payment, Apple said it will once again expand its share repurchase authorization to $140 billion from $90 billion and the company says it expects to spend over $200 billion in cash under its capital return program by the end of March 2017. Since the start of its capital return program in August 2012, Apple has returned over $112 billion to shareholders, including $80 billion in share buybacks. Apple sold 61.2 million iPhones during the quarter, up from 43.7 million a year earlier and a new March quarter record, while Mac sales were also strong with 4.56 million units sold, up from 4.1 million units in the year-ago quarter. iPad sales were down, however, falling to 12.6 million from 16.35 million. Apple's guidance for the third quarter of fiscal 2015 includes expected revenue of $46-48 billion and gross margin between 38.5 and 39.5 percent. Apple will provide live streaming of its fiscal Q2 2015 financial results conference call at 2:00 PM Pacific, and MacRumors will update this story with coverage of the conference call highlights. Good afternoon, everyone, and thank you for joining us. We have a lot of great news to talk about, so I'll jump right in. Today we're reporting our strongest March quarter ever, with 27 percent revenue growth, and 40 percent earnings per share growth year over year. We're seeing fantastic results for iPhone, with revenue growth of 55 percent year on year, and we're seeing a higher rate of switchers than we've experienced in previous iPhone cycles. The success of iPhone has been extremely strong in emerging markets, where unit sales were up 63 percent year on year. The App Store had its best quarter ever, with a record number of customers making purchases, driving a new record for revenue and 29 percent year-on-year growth. We also reached an all-time quarterly record of $5 billion in total services revenue. We also continue to defy the trend of declining global PC sales, with double-digit Mac unit growth in a market that IDC estimates contracted by 7 percent. We're now halfway through fiscal 2015, and our year-to-date results have been simply staggering. We sold over 135 million iPhones, 34 million iPads, and 10 million Macs in the first six months of the year. Our revenue has grown by 28 percent to over $132 billion, net income has increased 36 percent to over $31 billion, and EPS has grown by 44 percent. We're making more strategic investments in Apple's future, in research and development, in our supply chain, and in our infrastructure, and we made 27 acquisitions in the last 6 quarters. We're in the very fortunate position of generating more cash than we need to run our business, and keep making these important investments. So today, we're announcing another significant update to our capital return program, expanding its size to $200 billion through March of 2017 to reflect our strong confidence in what lies ahead for Apple. Luca will go into this in more detail in a moment. We're also making great progress in many other areas. The Apple ecosystem continues to expand in exciting ways. We're seeing great momentum with Apple Pay. Discover announced today that its cardmembers in the United States will be able to make contactless payments in participating stores through Apple Pay beginning this fall. And last month, we said that the number of locations accepting Apple Pay has tripled, and we continue to see great progress with merchants. Best Buy, which has been a longtime strong partner of ours, has just announced that it's now offering Apple Pay in-app, and later this year will offer Apple Pay in all of their U.S. stores. And merchants are the only ones jumping on board. Earlier this month, a leading healthcare payment network announced acceptance of Apple Pay for its clients, so over 50 major hospitals across the country, including Stanford Health Care and Aspen Valley will accept Apple Pay this year for co-pays and bill payments at registration and check-in. We're also incredibly inspired by the momentum we're seeing in health-related solutions. Since we released HealthKit with iOS 8 last September, over 1,000 apps have been developed to transform how people track, manage, and interact with their health, and they're now available on the App Store. Just this past weekend, Cedars-Sinai in Los Angeles turned on the largest HealthKit integration to date, giving more than 87,000 patients the ability to share their health and fitness data seamlessly with their My CS-Link app, which syncs with their electronic medical record. And last month, we announced ResearchKit, an open-source software framework that helps doctors and scientists gather data from medical research participants more efficiently and accurately using iPhone applications. The response so far has been simply amazing, far exceeding our expectations. The first research apps developed using ResearchKit study asthma, breast cancer, cardiovascular disease, diabetes, and Parkinson's disease, and have enrolled over 60,000 iPhone users in just the first few weeks of being available on the App Store. Over 1,000 researchers have contacted us expressing interest in performing studies through ResearchKit. We think these types of solutions have the potential to revolutionize medical studies in life-changing ways, and we're proud that Apple is helping make this possible. Last quarter, we also announced a major economic investment in Europe, where we will spend $2 billion to build data centers in Ireland and Denmark. These will be our largest data centers in the world. Apple is now responsible for creating over 670,000 jobs across the European continent. Most of them have grown out of the success of the App Store, which has generated more than $7.5 billion for European developers since just 2008. We feel great about the economic contribution we've been able to make in Europe. The two data centers we're building will run on 100 percent renewable energy from day one. This is just part of the work we're doing to protect the environment and leave the world better than we found it. Today, 100 percent of Apple's U.S. operations and 87 percent of global operations are powered by renewable energy. Just before Earth Day, we announced our plan to move to renewables in China. We're undertaking a ground-breaking partnership with several companies to build a 40-megawatt solar farm in Sichuan province. It will generate far more than the amount of energy used by all of our offices and retail stores in China combined. We also announced an innovative new partnership with The Conservation Fund to permanently protect more than 36,000 acres of working forest in Maine and North Carolina, to help offset the impact our packaging has on the world's supply of sustainable virgin fiber. Apple is deeply committed to these initiatives and will continue to make them a priority. The June quarter is off to an exciting start with great new products and services. Three of them in particular are giving our customers a glimpse of the future, and we are very happy with the reception each of them is receiving. First, the all-new MacBook began shipping just over two weeks ago, and we're very happy with the response we're getting from customers. The new MacBook is our lightest, most compact Mac notebook ever, and you really have to see it to believe it. It features a stunning, 12-inch Retina display, a new Force Touch trackpad, all-day battery life, and a revolutionary new keyboard. We believe, and I think most everyone agrees, this is the future of the notebook. Second is the new streaming service from HBO which is available on Apple TV and iOS. We teamed up with HBO last month to help launch HBO NOW, a standalone service that lets customers stream the content they love from HBO on the devices they love from Apple, all without requiring a subscription to cable. HBO NOW has been incredibly popular with Apple TV users since its debut, and it has been one of the top downloaded apps on the U.S. App Store as well. And third, of course, is Apple Watch. It's been really great to see the reaction of customers since their watches began arriving on Friday morning. All around the world, we've seen the excitement on social networks as people start using their Apple Watch. The response has been overwhelmingly positive. Adding to the surprise and delight of Apple Watch are the more than 3,500 apps that are already available. Our developer community has already seen the potential in this new category, and put some of their best thinking into what wearable technology can do. We can't wait to see more of the inspiring apps developers dream up for Apple Watch as we head into our Worldwide Developers Conference six weeks from now. I'd like to thank all of those developers and our hundreds of millions of customers for their loyalty and support. I'd also like to thank all of the Apple employees around the world for their creativity, tireless effort, and passion for delivering the very best products in the world. With that, I'll turn the call over to Luca. Thank you, Tim. Good afternoon, everyone. As Tim mentioned, we just completed another outstanding quarter. Revenue for the March quarter was $58 billion, an increase of $12.4 billion or 27 percent year over year. Growth was driven primarily by the very strong performance of iPhone, and the continued strength of the App Store and Mac sales. We achieved these terrific results despite growing foreign exchange headwinds. Our performance was particularly impressive in our Greater China and rest of Asia-Pacific segments. In Greater China, we established an all-time quarterly record for revenue, which grew 71 percent year over year to $16.8 billion. Gross margin was 40.8 percent, ahead of our expectations, mainly due to stronger than expected iPhone results. Operating margin was 31.5 percent of revenue, and that income was $13.6 billion, a new Q2 record. Diluted earnings per share were $2.33, a 40 percent year-over-year increase. Cash flow from operations was $19.1 billion, also a new March quarter record. For details by product, I will start with iPhone. We sold 61.2 million iPhones in the quarter, representing 40 percent year-over-year growth, and demand for iPhone 6 and 6 Plus has remained incredibly strong. iPhone sales more than double in Korea, Singapore, Taiwan, and Vietnam, and they were up 80 percent or more in several other markets including Canada, Mexico, Germany, and Turkey. The strong mix of iPhone 6 and 6 Plus, combined with the popularity of higher-capacity offerings led to iPhone ASPs of $659, an increase of $62 year over year, despite the very significant foreign exchange headwinds I already mentioned. We increased iPhone channel inventory by one million units during the quarter, which allowed us to get into the lower end of our target range of five to seven weeks of channel inventory. Next, I'd like to talk about the Mac. We sold 4.6 million Macs, representing 10 percent year-over-year growth, which is particularly impressive in the context of IDC's latest estimates of a 7 percent global PC market contraction. The growth was led by portables, and spurred by the updates to MacBook Air and MacBook Pro in March. We ended the quarter within our four to five week target range for Mac channel inventory. Turning to iPad, we sold 12.6 million compared to 16.4 million in the year-ago quarter. iPad sell-through was 13.7 million as we reduced channel inventory by about 1.1 million units coming off the holiday quarter. This left us within our five to seven week target range of iPad channel inventory. We set a new March quarter record for iPad sales in Japan, and an all-time record for iPad sales in China. Performance in other markets was more muted during the quarter. iPad turns five years old this month, and in every year since its introduction it has been the number one tablet in sales, in quantity and quality of tablet apps, in usage, and most importantly in customer satisfaction. And based on the latest data from NPD, iPad maintains a very strong leadership share in all of the price bands where we compete. iPad has also consistently been the number one tablet in enterprise. A recent ChangeWave survey found that among corporate buyers planning to buyer tablets in the next 6 months, 77 percent plan to purchase iPads. In fact, we have seen very high interest from companies who want to use iPad to transform how work gets done. The vast majority of the app opportunities that have been identified as part of the Apple and IBM partnership are specifically for iPad. In addition to IBM, we're working closely with more than two dozen other leading business software and solution providers, including Box, DocuSign, MicroStrategy, Revel, and ServiceMax, to bring a broad range of innovative mobile solutions to more customers on iPad. Turning to services, revenue grew to a new all-time record of $5 billion an increase of 9 percent year over year. The growth was led by the App Store, which remains incredibly popular with our customers around the world, with revenue up 29 percent in the March quarter. According to AppAnnie, the App Store generated 70 percent more global revenue in the March quarter than Google Play, up from a 60 percent lead in the September quarter. Traffic to our online and retail stores was excellent, with a 22 percent year-over-year increase in customer visits. We're progressing well with our plans for retail store expansion in Greater China, where we added 6 new stores in the last quarter alone bringing us to 21 stores in 11 cities. We are on track to have 40 stores open in Greater China by the middle of next year. Let me now turn to our cash position. We ended the quarter with $193.5 billion in cash plus marketable securities, a sequential increase of $15.6 billion. Over $171 billion of this cash was offshore. In the March quarter, we issued 6.5 billion U.S. dollar denominated notes and 1.3 billion Swiss franc denominated notes as we continued to diversify our global debt investor base. We've now raised a total of $40 billion of term debt at very attractive rates. We spent $7 billion to repurchase 56.4 million Apple shares through open-market transactions, paid $2.7 billion in dividends and equivalents, and utilized about $100 million to net share settle vesting employee RSUs. We also retired an additional 15.3 million shares during the quarter with the conclusion of the accelerated share repurchase program we launched last August. We have executed our capital return program aggressively, and we've now taken action on over $112 billion of our $130 billion program, including $80 billion in share repurchases at an average price of $85. As we've said consistently, creating value for shareholders by developing great products that enrich people's lives will always be our top priority, and the key factor driving our investments and our capital allocation decisions. With this framework in mind, Apple's board and management team continue to review capital allocation regularly, and we solicit input on our program from a broad base of shareholders. This process allows us to be thoughtful about the size, the mix, and the pace of the program. We very much appreciate all of the input the many shareholders have provided us. We continue to be in the fortunate position of being able to return significant capital to shareholders. We first announced our capital return program three years ago with an initial size of $45 billion, and we've increased it annually since then. Today we're announcing the third update to our program, expanding its size by the largest amount yet and extending its duration. The existing program was set to conclude at the end of this calendar year, and we're now extending the program by five quarters to the end of March 2017. Once again, with this update we're allocating the majority of the expansion of the program to share repurchases, given our strong confidence in the future of Apple and the value we see in our stock. The board has increased the share repurchase authorization by $50 billion, raising it from the current $90 billion to $140 billion. We will also continue to net share settle vesting employee restricted stock units. We also understand that the dividend is very important to many of our investors, and we are raising it for the third time in less than three years. The quarterly dividend will grow from $0.47 per share to $0.52 per share, an increase of 11 percent. This is effective with our next dividend, which the board has declared today and is payable on May 14, 2015 to shareholders of record as of May 11, 2015. We believe this a meaningful increase for those shareholders who value income and we continue to plan for annual dividend increases going forward. With over $11 billion in annual dividend payments, we are proud to be one of the largest dividend payers in the world. In total, the size of our revised capital return program will increase by over 50 percent, from approximately $130 billion to $200 billion. As we've done in the past, we expect to fund our capital return program with U.S. cash, future U.S. cash flow generation, and borrowing from both domestic and international debt markets. And we plan to provide the next update on our program at about this time next year. Now, as we move ahead into the June quarter, I'd like to review our outlook, which includes the types of forward-looking information Nancy referred to at the beginning of the call. We expect revenue to be between $46-48 billion, compared to $37.4 billion in the year-ago quarter. We expect gross margin to be between 38.5 and 39.5 percent. We expect OPEX to be between $5.65 billion and $5.75 billion. We expect OI&E to be about $350 million, and we expect the tax rate to be about 26.3 percent. With that, let's open the call to questions. Bill Shope, Goldman Sachs: When we look at the effect of currency on your gross profit, which I think was far less than anyone anticipated, have you been able to reduce some of the pressure by adjusting terms with your suppliers, or is that something we should expect to see more of as you progress through the year? Maestri: Let me give you some numbers on the currency because I know it's a topic that is top of mind. You're asking about gross margin, and you know we look at this on a sequential basis, and I mentioned during the call in January that we were expecting effects to have a negative impact on a sequential basis of about 100 basis points after the effect of the hedges, and that is exactly what happened in our actual results. So that was pretty much in line with what we were anticipating. Of course, we expect this headwind to continue, and on a sequential basis when we look into the June quarter, we expect to see another 40 basis points of negative impact from currency. We're dealing with these headwinds…they're part of business. And so, we're dealing with them in many ways. We are looking at, in some cases, the potential to increase prices in certain markets. We're looking of course at our cost structures, and we try to remain as competitive as possible, so we feel very good about the gross margins that we've generated in the March quarter, and we feel very good about the guidance that we provided given the severity of the impact. Shope: Okay, great. Then as a follow-up, I guess one of the incremental tailwinds to gross margin continues to be the iPhone upside relative to expectations. Could you give us a bit more color on the dynamics of the customer mix for the iPhone? You had mentioned you're very excited about the new-to-iPhone rate so far, but if you could give us a bit more color as we had last quarter, on folks that are new to iPhone, Android switchers versus replacement. Cook: Bill, we continue to see a higher rate of switchers than we have seen in previous cycles, so we're extremely excited about that. We also continue to see a reasonable percentage of first-time buyers, particularly in some of the emerging markets. And if you look at emerging markets in general, I think Luca covered some of this, the revenue from emerging markets just for the March quarter was up 58 percent year on year, and a big piece that is driving that is iPhone. Obviously those results would have been higher without some of the FX headwinds that Luca mentioned earlier. Shope: Okay, that's it for me. Thank you. Katy Huberty, Morgan Stanley: You've said in the past that the watch may take longer to ramp given the new category and new interface to customers. Is that in fact playing out? Is the watch ramping slower than past product categories? Cook: Katy, when you use the word "ramp," I assume you're talking about supply? Huberty: Yeah, pre-orders, and first weekend sales, and any other data points that you track in terms of interest versus, say, when the iPad launched in 2010. Cook: Let me tell you about supply and demand and sort of separate those two. Right now, demand is greater than supply, and so we're working hard to remedy that. We've made progress over the last week or so, and were able to deliver more customers an Apple Watch over the weekend than we initially anticipated. We're going to keep doing that, so we've already sent some notes out today with moving other customers in versus what we had communicated to them previously. So I'm generally happy that we're moving on with the ramp. It is a new product for us, and, you know, with any kind of new product, you wind up taking some time to fully ramp. Having said that, I think we're in a good position and by some time in late June we currently anticipate being in a position that we could begin to sell the Apple Watch in additional countries. And so that's our current plan. From a demand point of view, it's hard to gauge when you don't have product in stores and so forth, and so we're filling orders completely online at the moment. The customer response from people who have gotten theirs over the weekend has been overwhelmingly positive, and we're far ahead of where we expected to be from an application point of view. To give you a comparison, when we launched the iPhone, we had about 500 apps that were ready. When we launched iPad, we had about 1,000, and so our internal goal was to be able to beat the 1,000 level. And we thought it would be great if we could do that by a little bit, and as I mentioned before, we now have over 3,500 apps in the App Store for the watch. So we couldn't be happier about how things are going from that point of view. We are learning quickly about customer preferences between the different configurations. There's a much larger breadth of possibilities here for customers than in our other products, and in some cases we called that well, in some cases we're making adjustments to get in line with demand. But I'm really confident that this is something we really understand how to do, and we'll do. And so I'm really happy where we are currently, and happy enough that we're looking forward to expanding into more countries in late June. Huberty: That's great. And then as a follow-up, research and development spend continues to track well ahead of revenue growth, and that has happened for many quarters now. Can you talk about what's driving that? Is there a broader set of projects that you're working on? Are you making bigger bets? Entering bigger markets? What's driving such a long period of elevated R&D spend? Maestri: Katy, of course we've said this several times now…when you look at our product portfolio, it is much broader than it used to be. We now develop two new iPhones every year. We were not doing that a few years ago. We develop two iPads, and of course now we have the Apple Watch. We're also developing some core foundational technologies more in-house now than we were in the past. And of course we're also spending ahead of some of the products that will generate revenues in the future. So when you combine all of these factors, that is the reason why you see these research and development increases year over year. Research and development is the core of the company. Innovation is the core of the company, and we're very proud of the fact that when you look for example at the last two quarters, the first half of 2015, our revenue growth has been higher than our OPEX growth. And when you look at our expense-to-revenue ratio for the first half of the year, it's been 8.2 percent. It's lower than it was a year ago, and it's definitely something that we consider extremely competitive, and we're very proud of. Huberty: Okay, thank you very much. Gene Munster, Piper Jaffray: Good afternoon, and congratulations, and Tim, you mentioned there is more switchers versus previous cycles. Any thoughts on what that would mean or could mean for market share over the next few quarters, and kind of I guess the sustainability of the 6 cycle? And then second question for Luca in terms of any thoughts on what the margin impact from the watch is as that ramps over the next couple years? Thanks. Cook: Gene, if you look at the overall, worldwide, we grew iPhone 40 percent, and IDC's estimate of the market for last quarter is at 16 percent, so we grew two and a half times. And if you kind of look through at the different countries, in almost every country we grew at a multiple of the market. And as I mentioned before, in emerging markets we did extremely well. And so I feel really good about where we are, and you can hopefully tell with the strong guidance that we provided that we're very bullish on the current quarter as well. And so I think things look very, very good. We're also pleased, in addition to the switcher number, that we're doing fairly well with first-time buyers, which is also a key metric for us. And so it's tough to find something in the numbers not to like. Maestri: And Gene, let me take your question on margins. I'll talk about Q3, because you know this is the quarter that we provided guidance for, and when we guided to 38.5 to 39.5 percent, which is slightly down versus our performance in Q2, and this is driven by a number of things. First of all is the loss of leverage from the sequential decline in revenue. This is typical of our seasonality. There's a foreign exchange element, and I mentioned before the negative impact on a sequential basis of about 40 basis points. And also we're launching the Apple Watch. Apple Watch is not only a new product but it's also a brand-new category with a lot of new features, a lot of new innovative technologies, and Apple Watch margins will be lower than the company average. Munster: One maybe quick follow-up, Tim, in terms of the base of iPhones that have upgraded, I think you provided a number last quarter on that. Is there any update to that metric? Cook: Yes, sure. Our current estimate is that about 20 percent of the active install base has upgraded to a 6 or a 6 Plus. And so as I look at that number, that suggests there's plenty of upgrade headroom. In addition, we want to keep inviting over as many switchers as we can. So between both of those and the first-time buyers as well, it seems really good right now. Toni Sacconaghi, Bernstein: I just wanted to revisit the watch. You know, Tim, I think you said when you were talking about your new products, you said we're–quote–very happy with the reception, and in response to a previous answer you said that relative to demand it's hard to gauge with no product in the stores. I would say relative to other product launches, where your commentary around demand was characterized by superlative after superlative, that assessment feels very modest. Part of the reason that I ask is a) are we reading you right in terms of that? But if we look at consensus, consensus is expecting that Apple will ship more watches in its first two quarters than it did iPads, despite as you said very limited distribution in terms of only selling through your stores. So I'm wondering if you could talk a little bit about putting those demand comments in context given that they do seem different from how you characterized product demand for other products, and how, if at all, we should think about modeling demand in the context perhaps of the iPad, which was your most recent significant new category. And then I have a follow-up, please. Cook: I'm thrilled with, Toni, so I don't want you to read anything I'm saying any way other than that. So I'm not sure how to say that any clearer than that. And in any situation, whether it's the watch or in the past on iPad or on iPhone, when demand is much greater than supply it's difficult to gauge exactly what it is. And so, as you know, we don't make long-term forecasts on here. We make forecasts on the current quarter, and so I don't want to make any comment about the consensus numbers. Honestly, I haven't even studied those. We've got enough to think about here. I feel really great about it. The customer response…I mean literally from what I've seen is close to 100 percent positive, and so it's hard to imagine it being better. Sacconaghi: Okay, and I was wondering if, Luca or Tim, you talked about the watch having lower margins in the third quarter, which is surprising a) I think in the context of price points that many people thought were higher, b) in the context of what luxury watches sell for, c) I think in terms of what estimated margins might be on accessories like your watch bands. So I'm wondering if you believe that the watch's gross margins are being burdened by lower volumes and startup costs, and that you believe that as a category, watch margins will be in total, including everything else that you sell with it, will be on a sustained basis lower than the company average. Cook: Toni, we're not going to guide to or give projections of gross margin outside of the current quarter, so what we have right now, which is a situation that's not surprising to us…we knew we would be here…is that the watch gross margins for the current quarter that we've included in the guidance that Luca's provided in the aggregate, are lower than the company average. And so that to us is intuitive that it would be, and so I think we must just be looking at it through a different lens than you are. Sacconaghi: I guess the question is, is there anything unique about it being in its first quarter, providing that margin profile? Cook: In the first quarter of any kind of product, you would always have learning and these sorts of things. We've had that with every product we've ever done, and so, again, we're not guiding to what it will be over time. We're talking about what it is now. But I would keep in mind that the functionality of the product that we're making is absolutely incredible, the power of it. And I'd also say, I haven't even seen this, but generally there is cost breakdowns that come out around our products that are much different than the reality. I've never seen one that is anywhere close to being accurate. And so, if that's the basis for your comment, I'd really dig on the data if I were you. Shannon Cross, Cross Research: Tim, can you talk a bit about what you're seeing in China with 70 percent year-over-year growth in Greater China revenue and clearly very strong iPhone. If you can talk a bit about what consumers are saying, what carriers are saying in terms of demand, and in opportunities. Just any kind of color, because clearly it's quite strong. Cook: It was an incredible quarter. We were up 71 percent year over year. We set a record in China for revenues. We did that now in a quarter that included Chinese New Year, and so we had the help of the strong holiday season. Much like the U.S. has a strong season in December, China's is obviously in the March quarter. iPhone led the way. It was up over 70 percent year on year, and the current estimates from Kantar are that we would gain more than 9 points of share on a year-over-year basis, and so by everything I can see we did extremely well. The Mac also had an unbelievable quarter China, and I'm particularly very happy with this, that Mac unit sales were up 31 percent, and like most of the rest of the world, IDC is projecting that PC sales in China contracted by 5 percent last quarter. And so we're once again bucking the tide. Also in China, consistent with the company but at a much different rate, the App Store had a record quarter and grew over 100 percent year over year. And so you can see the iPhone, the Mac, and the App Store adding, and with the iPad in PRC, not in Greater China but in the PRC, iPad had its best quarter ever, higher than all the others, and also grew in a market that contracted for overall market. And so, really and truly, it's sort of everything you look at in China was extremely good. We have been working significantly on expanding our ecosystem there, and so we added UnionPay as a payment option for customers. We increased the iPhone point-of-sales to over 40,000 during the quarter. That's up about 9 percent year on year. And more importantly than the total number, we are in many more cities than we were before. We worked significantly on our online store, and our online store revenue was up over three times year over year. As you probably heard us say before, we've opened several stores in China recently. We're now at 21 in Greater China and we're on track still to achieve 40 stores by the middle of next year. The online store will also be expanding from around 319 cities to where they can hit two-day delivery to 365 cities, so adding about 50 new cities by the end of this quarter. And so the net is, we're investing a lot across the board in our infrastructure, in our products, on partnering with different companies. The Chinese developers are coming on in significant numbers. We've now made payments to developers in Greater China of almost $5 billion, over half of which was in the last 12 months. And so you can see this enormous momentum building in the developer community there as well. And so, lots of positive things, and as you probably heard me say before, I've never seen as many people coming into the middle class as they are in China, and that's where the bulk of our sales are going. And so we're really proud of the results there, and continue to invest in the country. Cross: Okay, great, that was helpful. And then just sort of a follow-up on the iPad side. What do you think it's going to take to reaccelerate iPads? I mean, the sell-through was better than the sell-in this quarter, but are we seeing cannibalization from the iPhone 6 Plus? How are you sort of thinking about the iBM partnership as it relates to iPad? Thanks. Cook: Yeah, I think number one, we have to stop having the situations where we sell through more than we sell in. So you know, where we don't have to have an inventory correction. That was over a million units. Two, have we had cannibalization? The answer is yes. 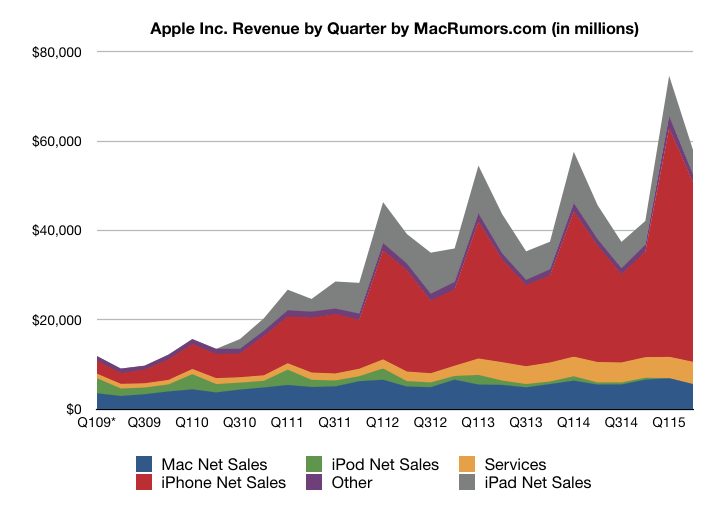 We've clearly seen cannibalization from iPhone and on the other side from the Mac. Of course, as I've said before, we've never worried about that. It is what it is. That will play out, and at some point it will stabilize. I'm not sure precisely when, but I'm pretty confident that it will. The IBM partnership, I think is in its early stages in terms of bearing fruit here, but everything I see I like on it. I'm a big believer in the ability for iPad to play in a major way in enterprise. And so I'm looking to seeing that play out as we move forward. When you look at the underlying data, it makes you feel a lot better than the sales do. And so things like first-time buyer rates, the latest numbers from the U.S. are somewhere around 40 percent, and if you look at China, they're almost 70 percent. And so these numbers are not numbers that you would get if the market were saturated. And so I continue to believe even though I've seen different people write that, that I think that theory is not correct, and do not see that. We also see usage numbers that are off the charts, so far above competition it's not even in the same planet. And we see customer satisfaction at or near 100 percent. So these kind of numbers along with intent to buy numbers…everything looks fantastic, the e-commerce numbers. And so my belief is, that as the inventory plays out, as we make some continued investments in our product pipeline, which we're doing, that we already had planned and have had planned for some time. Between that, the inventory playing out, the enterprise starting to take over, I think still, i believe the iPad is an extremely good business over the long-term. When precisely it begins to grow again I wouldn't want to predict, but I strongly believe that it will. Cross: Great, thanks very much. Steve Milunovich, UBS: Luca, could you comment a bit about the factors that went into your decision on the capital return program, particularly the share repurchase part? For example, I would think you're pretty well done in terms of taking U.S. cash down, so you are dependent on cash flow in the U.S., as well as debt. And regarding debt, do you have a debit-to EBIDTA ratio in mind that you don't want to go over? Do you want to keep your AA rating…is that important? Just other factors like capital spending needs, just curious what your thinking was. Maestri: Yes, Steve, so the logic has not changed over the years. We look at our business plans, we look at what we want to accomplish from a product perspective, we look at the capital needs that we have to run the business and to grow the business. And then we see that we're in this great position that we can return cash to shareholders. We know Apple very well. We are very excited by the level of customer response that we've got for our current portfolio. We're super confident about the pipeline of products and services that we have, and therefore we believe that there is great value in our stock. And that is the reason why again this year we are allocating the majority of the increase, which is the largest increase that we've ever done – we are increasing the program by $70 billion – and the vast majority of that we allocating to the share repurchase because, again, we believe there's great value in the stock. We also know and understand that we have several investors that value income, and so that is important for us to increase the dividend. And as we said in the past, we plan to continue to increase the dividend every year. And as we said in the past, we will come back at about this time next year and give you another update to the program because we will have better information and we'll be able to be very thoughtful about the size and the mix and the pace of the program. From a funding standpoint, of course we have a very strong balance sheet. We do have some cash in the U.S. We will continue to generate cash in the U.S., but definitely a good portion of the program will be funded through debt. We will raise debt both in the U.S. and outside the United States. And of course we've got a very, very strong balance sheet. We've got a very open dialogue with the rating agencies, and so we feel we have a lot of room for us to fund the program. So from a balance sheet standpoint, we feel very, very comfortable with the program that we have announced today. Kulbinder Garcha, Credit Suisse: Thanks. My first question is for Tim. Tim, on the comment you made about the 20 percent of the iPhone base being on the 6 and 6 Plus, are we right in interpreting the comment as that's substantially a lower number than at this point in previous cycles? And that would I guess argue for just a longer period of growth as the [unintelligible] upgrades. And then also linked to that, by the points you are making on new-to-iPhone users and switchers being higher. That number year-on-year, in the first six months, is clearly growing year on year. Is that the right way to interpret that comment? Then I have a follow-up. Cook: I missed the second part of your question totally. Can you get a little closer to your phone? Garcha: Oh,sorry…yes. So the second part of my question is, in the first six months of the 6 and 6 Plus, is the gross number of new users to Apple, whether it's new users or switchers from Android, significantly growing year on year? Cook: I don't have the comparisons in front of me, about the answer to either one of your questions. My understanding of what you asked was is the 20 percent number that I'd mentioned in the question from Gene…how does it compare year over year, is it a lot different. I don't know the answer to that off the top of my head. As I look at the number, my point from bringing it up is that there's a lot of people that haven't upgraded to a 6 and 6 Plus. And so, as I look at that, it screams that there's significant opportunity there, and that's before thinking about switchers and first-time buyers. Garcha: Luca, just from the gross margin decline from the March quarter to June…I understand the currency point. I understand the iPhone's a little bit older. I guess of the iPhone and the watch impact, can you help us…is the decline equally attributable to both those reasons, or is there something else going on? Maestri: So there are a number of reasons why our guidance for gross margins is lower than the actual for the second quarter. The first one is the loss of leverage because of the sequential decline in revenue. We've got the foreign exchange, we've got as you said a lower iPhone mix, we've got the Apple Watch, you know. I think we'll leave it as that and we're not going to get into more specifics. But those are the four reasons that drive the sequential decline. Keith Bachman, Bank of Montreal: Hi, Tim, this is for you. You mentioned something in your past comment that you thought a lot of the iPhone sales were going into the middle class in China. And I'm just wondering if you could elaborate on that and open it up more broadly speaking to the emerging geographies, if you have demographics that you could talk about for your iPhone specifically, and where you think those iPhones are ending up. Because I think it does raise the question as you look out over the next year or so, do you have the right price points for the demographics you're hitting? Cook: Here's what I would share with you, Keith. If you look in the emerging markets, our revenues were up 58 percent year on year, and this accounted for just slightly less than 40 percent of the company's revenue. If you look at BRIC within the emerging markets, BRIC countries were up 64 percent year over year. And so as I look at that without having market research on the demographics that you're asking, it's clear to me that it has to be coming from middle class. Because the upper income earners, there's only so many of those. And you can't grow those kind of numbers without getting significantly into the middle class. And so I think that's where we are. I hope we're also beyond the middle class, but I don't have the data to suggest that that's the case or not the case, but it's clear to me that the middle class statement has to be true. Bachman: Yeah, okay. Fair enough. My follow-on, I'm going to stay with you for a second, Tim, if you could. It sounds like HBO NOW is a great opportunity today and as you look out…if you could just speak more specifically how we should be thinking about Apple as a conduit for something like HBO NOW and other products. Is that a) a meaningful revenue opportunity, without getting specifics, and/or is it more about selling incremental devices, or is it about expanding the revenue pie as you look at opportunities like HBO NOW? Cook: First of all, I think it's about giving the customers something they want, and giving it to them with Apple's classic ease of use and in the product environment and the user interface they're used to working in. And in this particular case in Apple TV. And so I think HBO in particular has some incredibly great content, and so we're marrying their great content, our great product and ecosystem, and it's clear from looking at the early returns, you know we've only been at this for a couple weeks or so, that there's a lot of traction in there. And so, where could it go? I don't want to speculate, but you can speculate probably as good as I can about where that can go. I think we're on the early stages of just major, major changes in media that are going to be really great for consumers. And I think Apple can be a part of that. Fewer macs and ipads than expected. 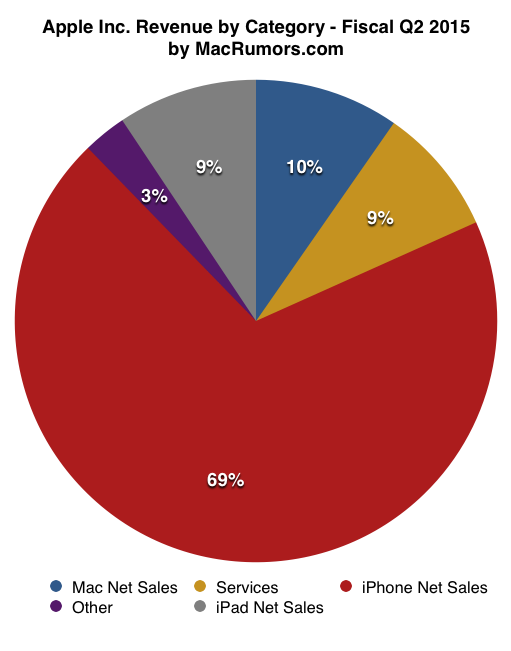 But notice that for the first time in a long time, Macs are a larger percentage of their sales than iPads. That's pretty amazing. "The call is beginning, unusually, about two minutes late." Mac. A measly 10% of sales. Apple will NOT give up on the Mac, trust me! Not with those kind of numbers! Most companies would KILL KILL KILL to have desktop computer sales numbers like that. Don't worry about the Mac folks, Apple will continue to invest in it. Yeah, "employ" as in slave labor and indentured servitude. You mean all those people in China who stand in long lines to voluntarily apply for those Foxconn jobs instead of going back to a more wonderful life in their home village? And end up with a lower statistical suicide rate than U.S. college students? If you really care, you are free to start your own company and offer them better paying jobs. I would suspect that a lot of the tablet demand was absorbed by the 6 plus. There's less of a justification for a lot of casual users to get an iPad. Well there we have it, folks. APPLE IS DOOOOOOMED!!!!! If they get a phone wrong, they are; they are so dependant on phones these days. Wow. They are doomed.... said no-one ever.